I think I can now state that my love for the golden years of Hollywood movies can be known as one of my defining factors. Rainy weekend afternoons and staying up late into the night, when everyone else had gone to bed, were spent watching black and white films of the early years of Hollywood’s first century. It was, and still is, a wonderful and magical way to spend hours. I recall so many of those stunning beauties of the era, decked out in the most splendid and spectacular finery that the art and costume departments of MGM, Paramount, Universal and RKO Pictures could turn out. I voraciously read everything I could get my hands on about the real movie stars: Mae West, Marlene Dietrich, Joan Crawford, Merle Oberon and so many more. These were some of the strong, modern women of their time. They had careers, fame, the love of their fans, the respect of their peers and …. they bought their own jewels. Yes, these women bought their own jewels and wore them. Sure, they could always borrow, but it just isn't the same. A woman who buys her own jewels makes a proud statement about herself to the world. She knows her own worth and isn't waiting around or hoping that a man will deliver! Though some stars were famed for their massive jewellery collections, am focussing here on the ladies who commissioned and purchased their own. These ladies were collectors of the great creative jewellers of the era: Verdura and Flato, to name just two. These men had the dream job, creating unique and fabulous pieces of wearable art that were owned and worn by the most luminous women on the planet. These men inspired me so many years ago, albeit circuitously, to be creative and find my own place in the world of jewellery. Barbara Stanwyck wearing her own platinum and diamond Gardenia necklace by William Ruser. The gardenias are detachable and she wears just one in the movie still from "Sorry, Wrong Number". Rita Hayworth, the quintessential star: sings, dances acts and plays the guitar. She wears an 18k white gold and diamond swag necklace by Paul Flato. Joan Crawford loved jewellery, especially statement rings set with large gemstones. In this photo, she is wearing a 72ct emerald-cut Sapphire. Gorgeous Paulette Goddard shown here with her husband, Charles Chaplin. She was known for her collection of beautiful jewels. This one is the Feather platinum necklace encrusted with diamonds. Shown here is the 200ct Star Sapphire that Mary Pickford is wearing, known as the Star of India. When not in use, it was kept in a vault. 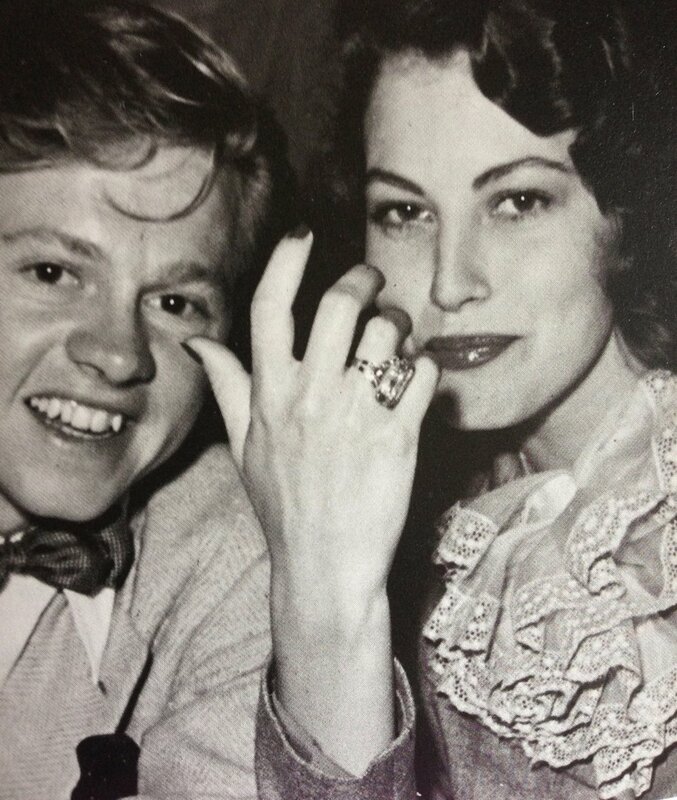 Ava Gardner and Mickey Rooney were engaged in 1942. The ring her gave her was diamonds set in yellow gold. During the war years of 1940-45, platinum was not available for use in jewellery. Mae West donated her sizeable collection of platinum jewels for the war effort. Platinum was used in making and repairing airplane parts. Paulette Goddard was also a savvy little recycler! She had her numerous charms soldered onto a bracelet and a compact. That day I paid a visit to the Verdura salon in NYC. That's me wearing Marlene's 18k yellow gold and diamond Verdura cuff.